As the “Village on the River”, Taylors Falls is part of the chain of five small towns that make up the community of Chisago Lakes. Nestled along Highway 8, these small towns work together, yet are uniquely their own. Begin the three-mile descent into Taylor’s Falls and notice the large-scale rock walls bordering one side of the highway, while expansive forest views appear on the other. As you drive into the St. Croix Valley and the town of Taylors Falls, watch for rock climbers scaling the cliffs along the river or hikers exploring the glacial potholes at Minnesota Interstate State Park. This enchanting river town could easily be the backdrop for a Hallmark Channel movie. The massive tree canopy, boasting brilliant colors in the fall, enfolds itself over the winding road as you continue your descent towards the town and get your first glimpse of the St. Croix River. Designated as a National Wild and Scenic Riverway in 1968 by Congress, the river has always been pivotal to this community. The area’s first immigrants traveled here via that river, later loggers took advantage of the flowing waters to drive milled logs downstream, and today it serves as a recreation mecca for fishing, canoeing/kayaking and paddle boat excursions. Eat dinner at the old-fashioned drive-in and other great eateries and then test your skill at mini golf. Explore the town’s historic Angel Hill District including the Folsom House, a restored 1850’s home from the hey-day of the lumber era. Enjoy an ice-cream cone from the malt shop and relax in the cupola of a Victorian home turned coffee shop while sipping your favorite drink. Experience a small-town Christmas festival with Santa and his helpers and join in the fun during Wannigan days, the area’s summer festival. Just outside of town, venture northward and enjoy the scenic drive to an outdoor recreation area specializing in fun for all seasons or kick back, listen to music and enjoy a glass of wine at one of the local wineries. 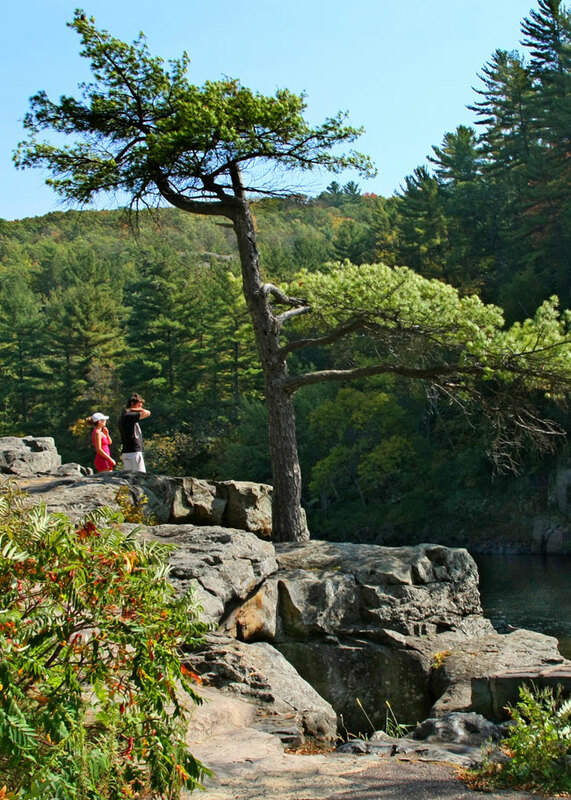 Interstate State Park – Interstate Park comprises two adjacent state parks on the Minnesota–Wisconsin border, both named Interstate State Park. They straddle the Dalles of the St. Croix River, a deep basalt gorge with glacial potholes and other rock formations. The Minnesota park is 298 acres. It has a campground with showers and 37 sites, 22 of which have electrical hookups. A group campsite accommodates up to 100 people. There are 4 miles of trail. A long-standing concession offers scenic boat cruises and canoe and kayak rentals.